This article is about Assist Trophy. For the trophy based on the Rayman character, see List of SSB4 trophies (Others). Barbara in Jam with the Band. 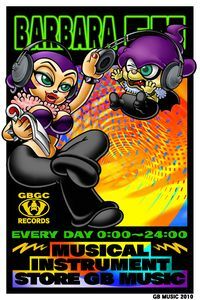 Barbara (バーバラ, Barbara), whose full name is Barbara the Bat, is the mascot of the Jam with the Band series. 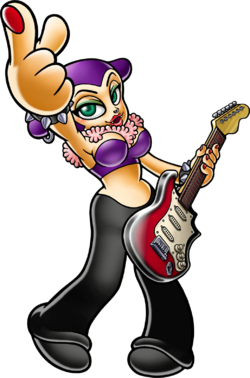 Barbara, as she appears in Jam with the Band. Barbara debuted in the Japan-only game Daigasso! Band Brothers. She is the manager of the music store, GB Music, in Waruwaru Town, and an avid guitar player. She guides the player throughout the game and possesses a rather arrogant personality. She also appears in the Nintendo DS game Master of Illusion. Barbara in gameplay in Brawl. Barbara appears as an assist trophy. She is unlocked for use after collecting 25 CDs. 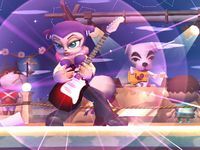 Her attack is similar to Donkey Kong's Konga Beat: upon appearing she remains in place for a few seconds, playing her guitar which produces musical shockwaves that damage the summoner's opponents and cause reasonable knockback. Her last soundwave has a bigger range and damage. The Barbara trophy from Brawl. The manager of the music store GB Music in Waruwaru Town--her real name is Barbara the Bat. She leads the player through the game, showing her arrogant attitude as she cracks the whip at others but pampers herself. Her little brother's name is Tingtin the Bat. By the way, the "GB" in the name of her store stands for "Great Barbara," NOT "Game Boy." A Mii Gunner wearing the Barbara the Bat Wig. Barbara does not return as an assist trophy. However, a piece of headgear based on her hairstyle, the Barbara the Bat Wig, is available to Mii Fighters. Barbara's trophy is exclusive to Super Smash Bros. for Nintendo 3DS. The Barbara trophy from for 3DS. As the manager of a slightly dubious talent agency, Barbara's always looking for people who want to join a band. She'll even teach you to play—whether you ask her or not. It's best to let her think she's taking advantage of you, even if she really isn't. Her hidden theme music really illustrates the contrast of darkness and light in her soul...or something. The headgear that resembles Barbara returns as for the Mii Fighters and she also appears as a Spirit. If Barbara is summoned while the game's speed is at 1.5x, she will disappear before the music has a chance to finish. This page was last edited on February 18, 2019, at 04:25.